Did she survive the crash? Evidence says yes. 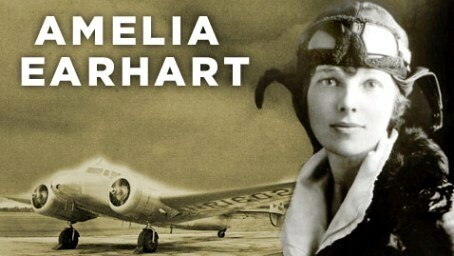 MSNBC (original article from Discovery News), June 1, 2012 -- Dozens of previously dismissed radio signals were actually credible transmissions from Amelia Earhart, according to a new study of the alleged post-loss signals from Earhart's plane. The transmissions started riding the air waves just hours after Earhart sent her last in-flight message. The study, presented on Friday at a three day conference by researchers of The International Group for Historic Aircraft Recovery (TIGHAR), sheds new light on what may have happened to the legendary aviator 75 years ago. The researchers plan to start a high-tech underwater search for pieces of her aircraft next July. "Amelia Earhart did not simply vanish on July 2, 1937. Radio distress calls believed to have been sent from the missing plane dominated the headlines and drove much of the U. S. Coast Guard and Navy search," Ric Gillespie, executive director of TIGHAR, told Discovery News. "When the search failed, all of the reported post-loss radio signals were categorically dismissed as bogus and have been largely ignored ever since," he added. Using digitized information management systems, antenna modeling software, and radio wave propagation analysis programs, TIGHAR re-examined all the 120 known reports of radio signals suspected or alleged to have been sent from the Earhart aircraft after local noon on July 2, 1937 through July 18, 1937, when the official search ended. They concluded that 57 out of the 120 reported signals are credible. "The results of the study suggest that the aircraft was on land and on its wheels for several days following the disappearance," Gillespie said. Time, June 4, 2012 -- It is now believed that Earhart and Noonan crashed on Nikumaroro Island in the western Pacific, where they radioed for help until the Lockheed Electra aircraft was swept away. At that point, they could no longer make calls for help, relying on their wits and chance. The group hypothesizes that Earhart’s remain still lie somewhere on the island. Why did Amelia want to fly planes? When 10-year-old Amelia Mary Earhart saw her first plane at a state fair, she was not impressed. "It was a thing of rusty wire and wood and looked not at all interesting," she said. 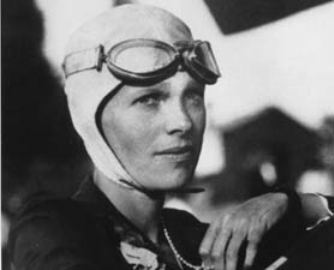 It wasn't until Earhart attended a stunt-flying exhibition, almost a decade later, that she became seriously interested in aviation. A pilot spotted Earhart and her friend, who were watching from an isolated clearing, and dove at them. "I am sure he said to himself, 'Watch me make them scamper,'" she said. 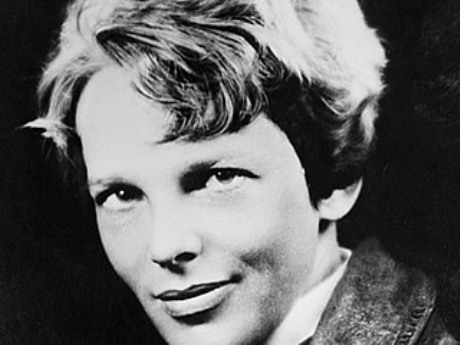 Earhart, who felt a mixture of fear and pleasure, stood her ground. As the plane swooped by, something inside her awakened. "I did not understand it at the time," she said, "but I believe that little red airplane said something to me as it swished by." On December 28, 1920, pilot Frank Hawks gave her a ride that would forever change her life. "By the time I had got two or three hundred feet off the ground," she said, "I knew I had to fly." 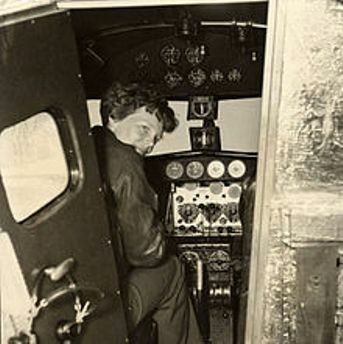 Earhart's life revolved around flying. She placed third at the Cleveland Women's Air Derby, later nicknamed the "Powder Puff Derby" by Will Rogers. As fate would have it, her life also began to include George Putnam. The two developed a friendship during preparation for the Atlantic crossing and were married February 7, 1931. Intent on retaining her independence, she referred to the marriage as a "partnership" with "dual control." 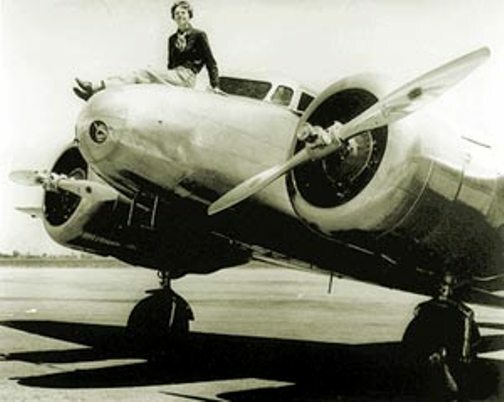 Earhart broke many records. She set an altitude record for autogyros of 18,415 feet that stood for years. On January 11, 1935, she became the first person to fly solo across the Pacific from Honolulu to Oakland, California. In 1937, as Earhart neared her 40th birthday, she was ready for a monumental, and final, challenge. She wanted to be the first woman to fly around the world. As dawn neared, Earhart called the ITASCA, reporting "cloudy, weather cloudy." In later transmissions earhart asked the ITASCA to take bearings on her. The ITASCA sent her a steady stream of transmissions but she could not hear them. Her radio transmissions, irregular through most of the flight, were faint or interrupted with static. At 7:42 A.M. the Itasca picked up the message, "We must be on you, but we cannot see you. Fuel is running low. Been unable to reach you by radio. We are flying at 1,000 feet." The ship tried to reply, but the plane seemed not to hear. At 8:45 Earhart reported, "We are running north and south." Nothing further was heard from Earhart. Did you know that Amelia was not alone on her last flight? What is not widely known is that Amelia Earhart traveled that fateful last flight with a navigator named Fred Noonan. Frederick Joseph "Fred" Noonan (April 4, 1893 – missing July 2, 1937, declared dead June 20, 1938) was an American flight navigator, sea captain and aviation pioneer who first charted many commercial airline routes across the Pacific Ocean during the 1930s. He was last seen in Lae, New Guinea, on July 2, 1937, and disappeared with Amelia Earhart somewhere over the Central Pacific Ocean during their attempted round-the-world flight.